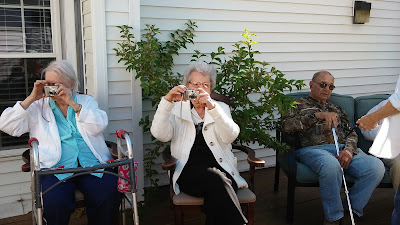 I've started teaching photography at the assisted living home! Two weeks in and this has already been a wonderful experience for both myself and the residents. The hope is that they may start to develop new ways to create and maintain memories. When I look at a photo I've created, my mind fills with memories of everything surrounding that moment. The sweat on my brow, the conversation I had before the shoot, how embarrassed I was that my battery died, and even sifting through the photos to make a print. The physicality of doing all these actions associated with creating a photograph really reinforce those memories in my mind when I look at the image in my hands. So, perhaps these folks may be able to take away something from that. Maybe they might even learn new ways to express themselves. Get in tough with feelings they've been repressing. Let us know what's really going on. At the very least, it is a fun way to spend the afternoon. Once the class is over, we will print their photos and create a gallery showing in the home along with a reception. BIG shout out to the Exeter Community Thrift Shop for their generous donations! Without their help this class would not have been possible.